2012 Annual Report on the extrajudicial killing of 313 Black people by police, security guards and vigilantes. The Report exposes how every 28 hours someone inside the United States, employed or protected by the U.S. government kills a Black child, woman or man. These state-sanctioned killings are the casualties of what we call “Operation Ghetto Storm,” a perpetual war to invade, occupy and pacify Black communities– much like the U.S. invades and occupies the Middle East. “Operation Ghetto Storm” written by Arlene Eisen, with preface by Kali Akuno, is published by the Malcolm X Grassroots Committee. It is also available, with other important resources at http://www.mxgm.org. The Context for Operation Ghetto Storm The facts presented in Operation Ghetto Storm: 2012 Annual Report on the Extrajudicial Killing of Black People present us with a deeper understanding of the utter disregard held for Black life within the United States. Operation Ghetto Storm is a window offering a cold, hard, and fact‐based view into the thinking and practice of a government and a society that will spare no cost to control the lives of Black people. 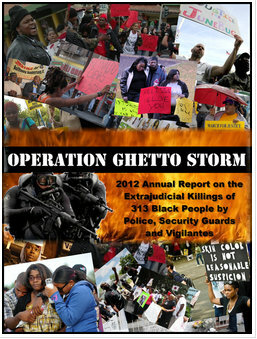 What Operation Ghetto Storm reveals is that the practice of executing Black people without pretense of a trial, jury, or judge is an integral part of the government’s current overall strategy of containing the Black community in a state of perpetual colonial subjugation and exploitation In July 2012, in the tradition of “On Lynching” by Ida B. Wells‐Burnet and “We Charge Genocide” by William L. Patterson, the Malcolm X Grassroots Movement released a critical report that exposed the fact that in the first six months of the year a Black man, woman, or child was summarily executed by the police, and a smaller number of security guards and self‐appointed vigilantes, Every 36 Hours! But, the July 2012 report did not tell the whole story. Further investigation revealed a more accurate and gruesome number of extrajudicial killings during the first six months of the year. And true to form, the assault on Black life stayed consistent for the last six months of the year, resulting in the extrajudicial killing of at least 313 Black people in 2012, or one Every 28 Hours!